Having good images on your Facebook advertisements is very important. Good images can engage the viewer, help them make better decisions, and ultimately, get you the sale! But putting together good images can be difficult. 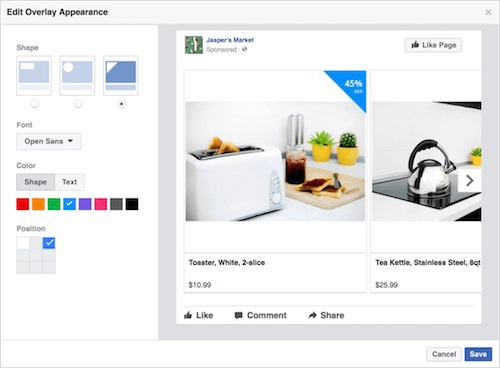 Facebook Ads has gone ahead and made this process a little easier by offering dynamic ad overlays to everyone. Dynamic ad overlays can do a variety of things for your ads. You can apply price tags or “Free Shipping” tags over your image. All of these are made within the Facebook ad platform and do not need any photo editing software. The tags are also dynamically generated, meaning a price tag will pull the price from the ad data, making it very easy to apply overlays to many products at once. With these overlays, there are many customization options you can apply. You can pick various shapes, fonts, colors, and positions for the ads. 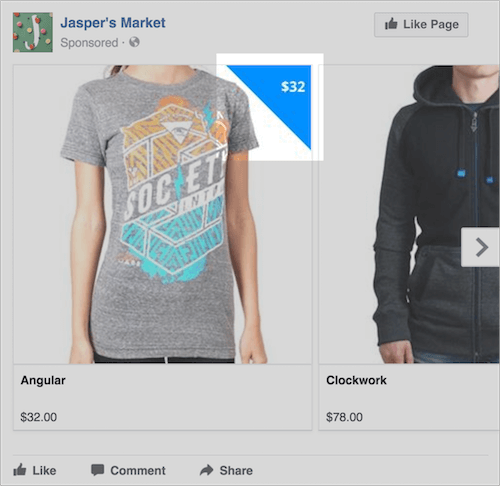 This helps you personalize your ads to make them stand out in the best way possible. However, there are some limits to what you can do with overlays. One of the most significant limitations is character limit. Each shape has its own character limit, so this may influence which design you go with. It may depend on how much you need to write. To get started, you will need an accurate product feed submitted in the Catalog Manager within Facebook. This data will be used when you create the ads in the ad creation page. You can see more information about a Facebook product feeds here. Having an optimized product feed will make overlays an extremely easy process to go through. Request a demo with us and we can show you how we make it easy to have an accurate and optimized product feed you can use anywhere with confidence.